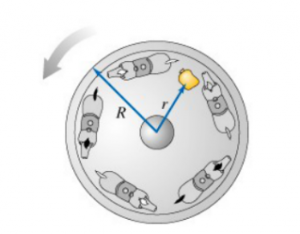 A merry-go-round of radius R. shown in the figure, is rotating at constant speed. The friction in its bearing is so small that it can be ignored. A sandbag of mass m is dropped onto the merry-go-round, at a position designated by r. The sandbag does not slip or roll upon contact with the merry-go-round. Rank the following different combination of m and r on the basis of the angular speed of the merry-go-round after the sandbag "stick" to the merry-go-round. Thus, more means more , and more means less .